You must decide who lives and who dies. The city is infected with a nasty virus which turns people into Zombies, which spread quicker then the scientists could cure. An army has stepped in to kill anything that moves, because of the panic. Nobody is quite sure where the virus came from, so everyone agreed to clear as many areas by force. However, the scientists who feel responsible will stay behind - at all costs. 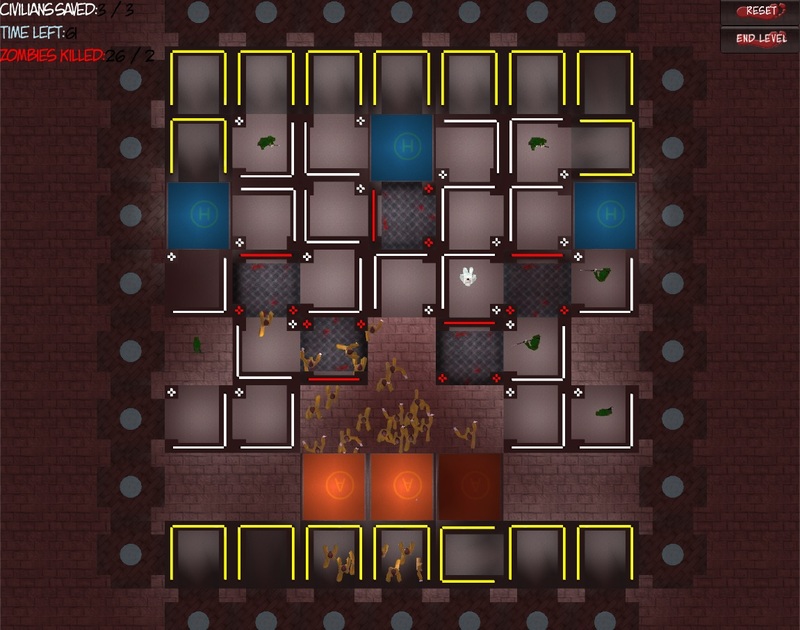 This is an extremely hard puzzle game, featuring zombies. A set number of the blue characters (civilians) must reach the exist zone (blue area). A set number of orange characters (zombies) have to be eliminated. ...all before the time runs out. If a zombie reaches the reaches the blue area, you are penalized 2 civilian units. 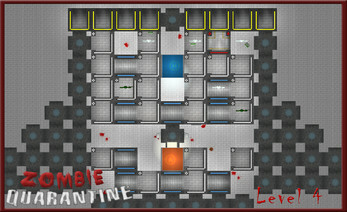 Every level has a code, which can be accessed through the main menu & load. The green characters (the army) act as towers, and can't move. But they will kill any character. Beware. The white characters are scientists, and they can cure zombies back into civilians. There are buttons at the top of the screen which let you end the game, or reset the current level. Press ESC anytime to bring up the save and load menu. 1) Units change direction when they are in the middle of certain paths such as the corners and the T-sections. They will also change direction if they run into a wall, or another unit. 2) Scientists have a range of about 1 & 1/2 halls. 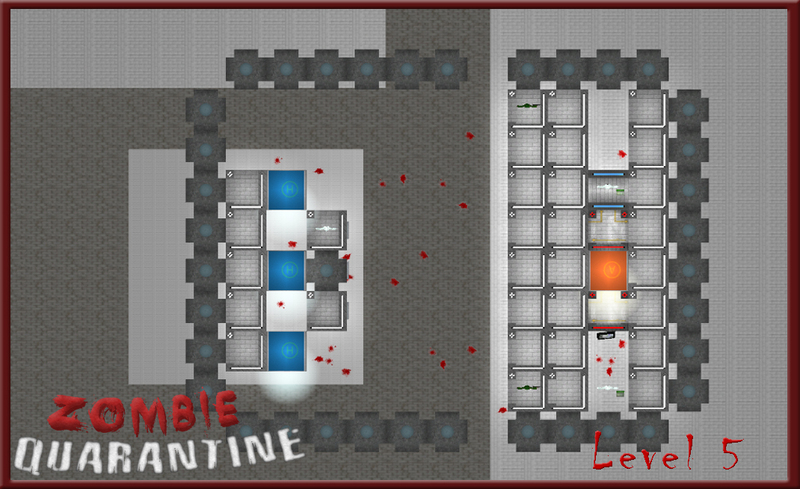 When you see a scientist move, the effected zombie has about 3 seconds until they are cured into a civilian unit. 3) Some army personnel can kill zombies with 1 shot. 4) Isolating individual units quickly, and reserving them for later can help with the pace of the game. Level 5 is a real test of this tactic. 5) There are wooden barricades on certain levels which only zombies can destroy. Click on the walls to create a safe or unsafe path for the characters. Use the AWSD keys to move the camera around the level. The the mouse wheel to zoom in and out. 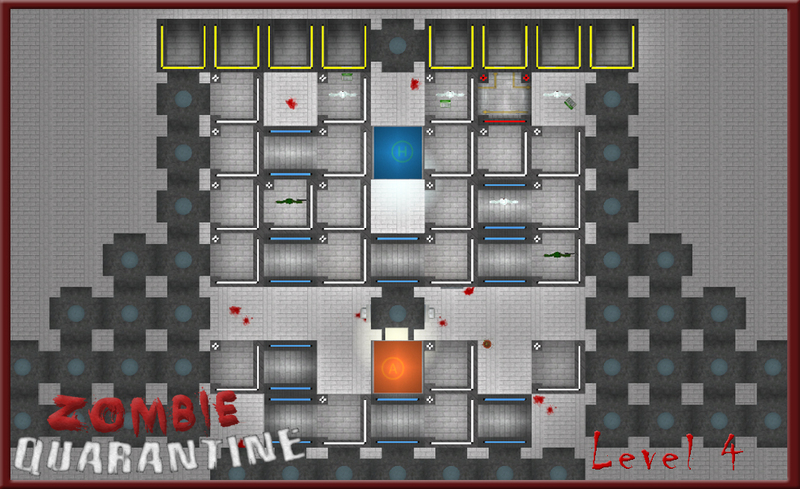 Every level has an optional camera view. Clicking on the change camera button will swap to a alternate camera view. Click the change camera button again to stop the rotation of the camera. Clicking the button a 3rd time will reset it back to the main camera. There may be updates for this game, depending on the public opinion on the concept. Anyone to purchases this version will receive new versions for free. If the sound and music seems to not be working, it may be off by default. It can be turned back on through the main menu. 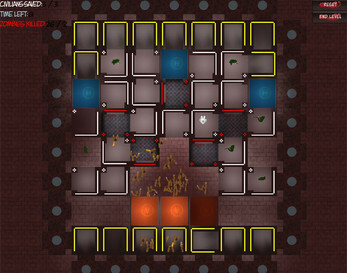 If the hall areas get filled with too many units, they may glitch and push each other through walls, or push each other off the main middle path. So try and keep them all moving, just for long enough for you to reach the requirements, and hit the end level button. No units spawning - this is a rare glitch, but to fix it, go back to the main menu and click on options > credits & help. Then try the game again. Somehow, that might fix the spawning issue. The Android version not on GooglePlay anymore, and is slightly different to the other versions. Made in Unity v4 & 5.